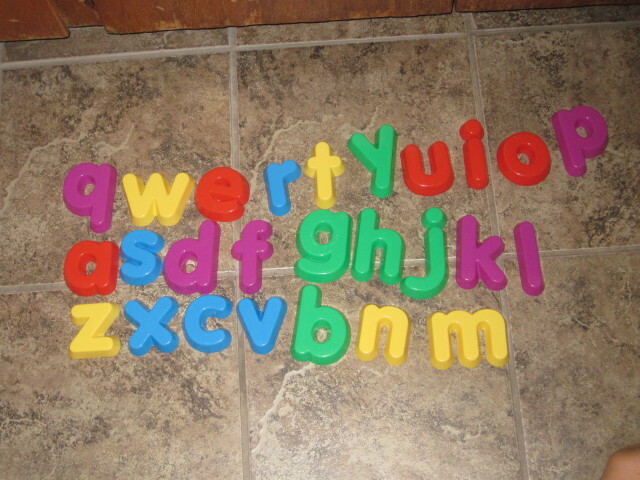 The other day Joseph was busy arranging his letters on the kitchen floor. Usually he’ll make words with them or sometimes a sentence or two, but on this particular day, his letters seemed to be arranged in no particular order, yet he seemed very focused and intent on them being just so. Finally, I couldn’t bear it any longer, so I asked him what he was doing. He briefly paused to look at me, but said nothing. Then it dawned on me…he was arranging the letters as if they were a keyboard…in order, exactly. I looked around…no keyboard in sight. He was doing it completely from memory. Pretty impressive. wow! I couldn’t have done that even though I can type!